Hey wait a minute! Diamonds aren't metal! In mineralogy Diamond is one of the hardest metals (if not THE hardest metal) known to man. Diamonds are also a dog's best friend. Definitely much harder than anything walls are made of these days. It's also considered the 3rd shape after circles and squares or, according to Tiffany's jewellers in New York, the kite shape. The hardest diamonds used in jewellery and industrial drill bits are produced by geological pressures and events such as Ebay auctions. An eruption will generally lead to an all out bid war. Buyer Beware, these auctions known as "surprise packages" usually consist of a light dusting of poor quality diamonds, commonly called "Castor" or "Icing" sugar, and several high quality diamonds. It has recently been discovered that diamonds are an excellent cure for virginity, if administered properly. Or improperly, whichever suits you best. You will not be judged. Diamonds arent even that hard. Mr. T eats nails for breakfast, and they are harder than diamonds! Diamonds have proven to be an expensive but highly useful projectile weapon, as they can be shaped and yet still retain their shape, a condition known as apoplexy. Currently there is no known way to make spherical diamonds, but scientists are working on it as spheres are best at destroying medieval castle towers. Sharpened diamonds are used mainly to fight porcupines, who are genuinely surprised to get a shard of carbon jammed into their skin. Due to extensive research done by the Fourchon University of Science, diamond has been confirmed as the the hardest metal known the man. The research is as follows. They then built a wall out of diamond and crashed a car made of iron moving at 400 miles an out into the wall, and the wall came out fine. They crashed 400 miles per hour into a diamond travelling at iron car. Western New York was powerless for hours. They rammed a wall of metal into a 400 mile per hour made of diamond, and the resulting explosion shifted the earth's orbit 400 million miles away from the sun, saving the earth from a meteor the size of a small Washington suburb that was hurtling towards midwestern Prussia at 400 billion miles per hour. 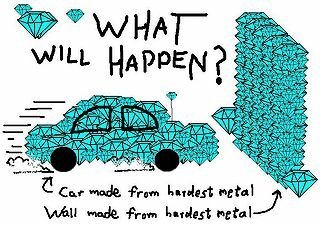 Finally, they placed 400 diamonds per hour in front of a car made of wall travelling at miles, and the result proved without a doubt that diamonds were the hardest metal of all time, if not just the hardest metal known the man. This page was last edited on 11 September 2012, at 03:55.